Simmering institutional and visceral racism directed at Britain's Black communities led to outbreaks of rioting and uprisings in 1981 across the country. 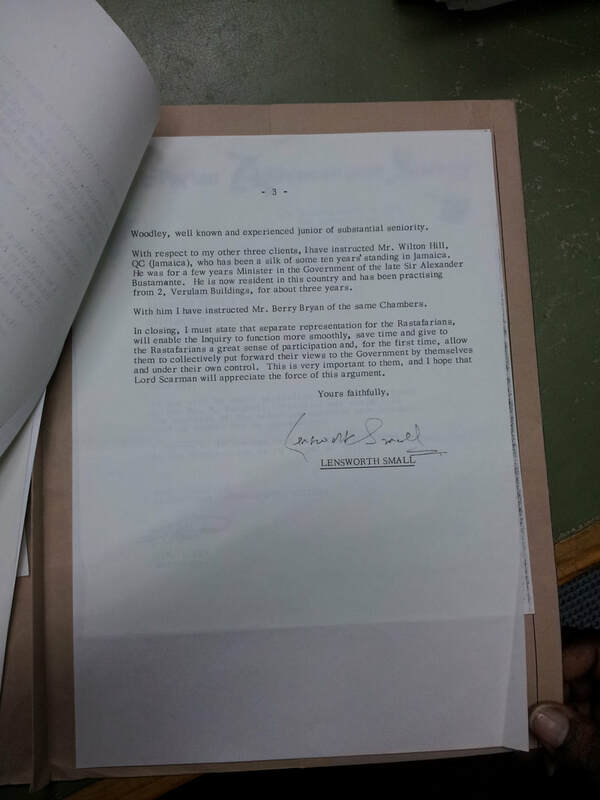 Subsequently, Lord Scarman was tasked with leading a public inquiry into the insurrections. Scarman certainly accepted some of the racist conventions of the day, for example, assuming that the Black family unit was ""dysfunctional". Nevertheless, he was also adamant that problems of disorder had to be addressed by reference to the inequitable social and economic conditions suffered by Black communities. Scarman seemed to especially want to enter into dialogue with the Rastafari movement. 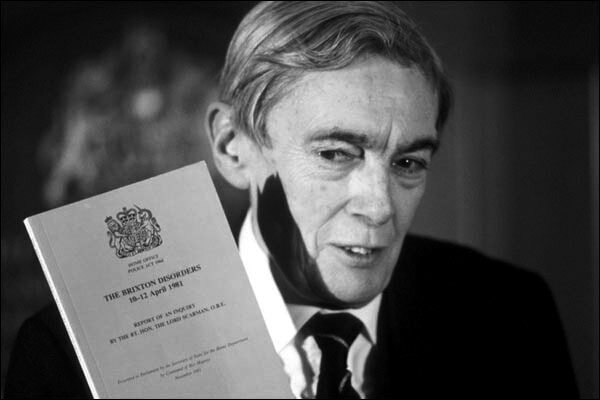 He consulted Len Garrison’s research on Britain's Rastafari movement in preparation for his report, and established contact with a number of prominent Rastafari groups, including Jah Bones and RUZ. ​It is interesting to note that Scarman would have been 25 when the Italy/Ethiopia war erupted in 1935, and a year later he joined Middle Temple as a Harmsworth Law Scholar. Perhaps Scarman recognized in Rastafari the Ethiopian motifs that, forty-five years earlier, had stood for international justice. 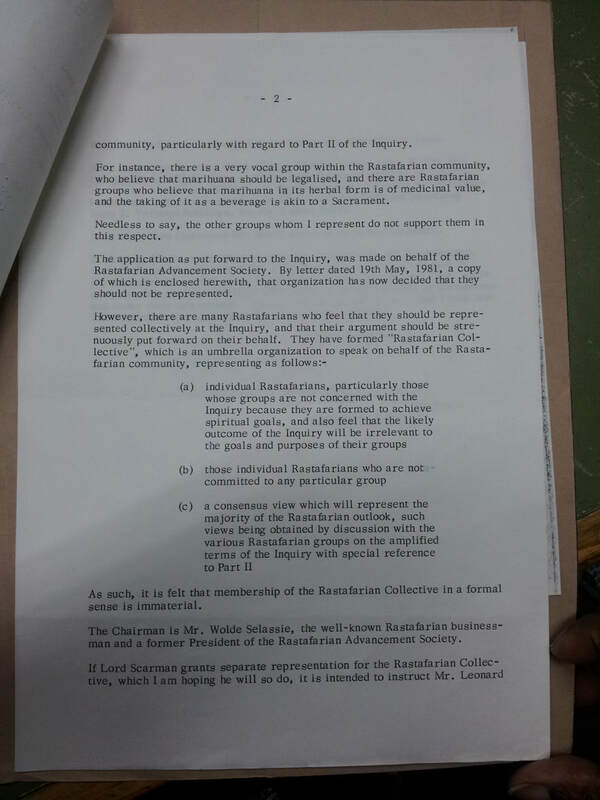 The following documents suggest that, for representatives of Scarman, Rastafari was an amorphous, misunderstood and peculiar group to negotiate with. 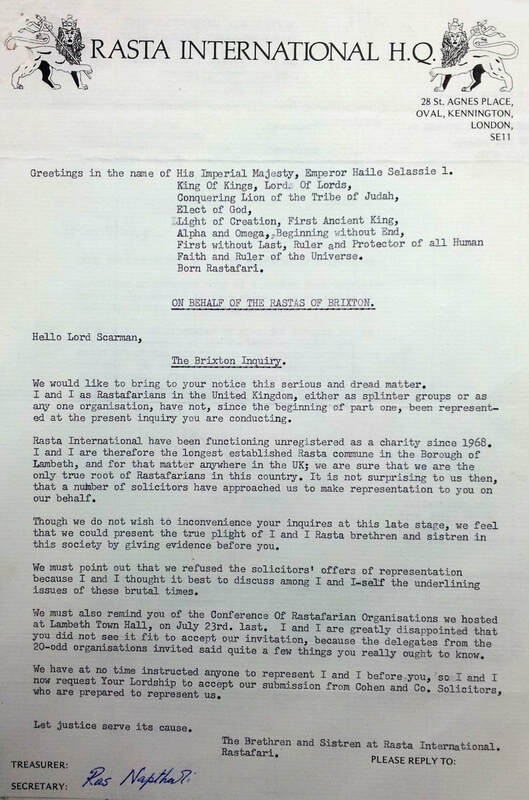 The documents also suggest that, at this point in time, Rastafari themselves were learning how to diplomatically engage with representatives of what they considered to be "dutty Babylon".